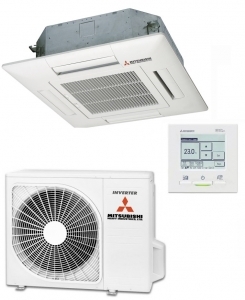 The Mitsubishi FDTC50VF cassette air heat pump and air con unit - Is a compact cassette style designed to fit into 600mm ceiling grids. Full reverse cycle heat pumps such as this can heat and cool your premises, and are up to 40% per cent cheaper to run compared to electric only heating systems, and of course you can also cool during the summer with this system. Full information on this Mitsubishi compact cassette system can be found in the manufacturer’s brochure below.